I cannot get enough of roasted veggies in the fall and winter and I’m always looking for new ways to serve them. If I’m on my own, I’m happy to just cook up whatever is in the fridge, toss it in a bowl and call it dinner but I think this solution makes for a nice variety and better presentation. I used olive oil, balsamic vinegar (for a bit of a bite), crushed garlic and salt and pepper on these and was thrilled with the outcome. You can change up the veggies to whatever suits your taste and if you don’t care for spinach, try some radicchio or arugula. It’s just a matter of roasting your favourites in the oven for 35 minutes and then tossing in the greens and nuts. For some extra flavour and colour, I steamed some green beans and added them as well. I love fresh, crisp beans, they really amp up a dish. I used rosemary but you can use thyme, savory, or any other favourite. It’s always fun to experiment with the flavours and roasting veggies brings out the very best in produce. Have a great week, everyone. Cheers! handful of pine nuts or whatever nut you prefer. I used roasted, unsalted pumpkin seeds. Preheat oven to 400 F. Combine, zucchini, eggplant, bell peppers, mushrooms, red onion and garlic in a large bowl. In a small bowl combine olive oil, balsamic vinegar, salt and pepper, stirring well. Pour over vegetable mixture and toss gently to coat. 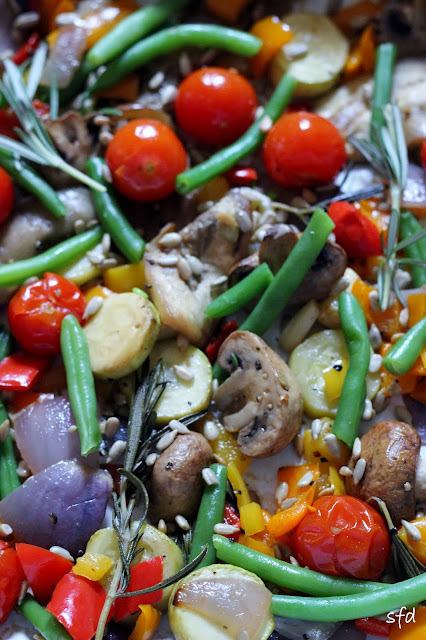 Spray a baking sheet or pan and place veggies on it, spreading them out to ensure even roasting. Roast for 20 minutes and add cherry tomatoes and thyme. Toss gently and roast an additional 10 minutes. Steam or boil green beans for 3 minutes, drain and immerse into bowl of ice water until beans are bright green. Pat dry and add with nuts and spinach to veggie mixture. Serve immediately. I love your roasted veggie dish and a great idea to add some nuts as well. I will have to try that next time. Hi Robyn, Thanks for popping by the Domestic Dunce to say Hi. I’ve had a quick look at your blog and I will definitely be back to try some of your recipes. 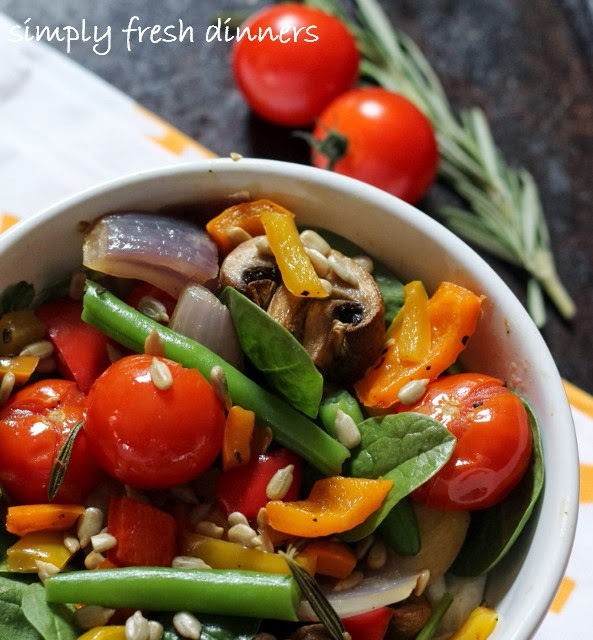 The roasted veg salad looks delicious and simple enough even for me! 🙂 I need more veg in my life. Sounds like heaven, my kind of dish! I roast veggies all the time but never tried balsamic, will do, thanks! Thanks so much! I just took a peek at your beautiful blog and I am about to go back for more! Thanks so much. Now I’m going to peek at those fantastic layered pumpkin mousse on your blog! Hey there! I just wanted to say thanks for stopping by and linking up to The PINcentive Blog Hop :o) Hope you’re having a great week! Happy to join in and thanks for hosting! And your blog I way too much fun, Gigi! So glad we connected! I don’t know why I always forget about roasting when it comes to vegetables! These look great! Thanks for linking up to Let’s Get Real! Sure thing, Nicole, and thanks for visiting! Hi Robyn! Your salad looks beautiful. 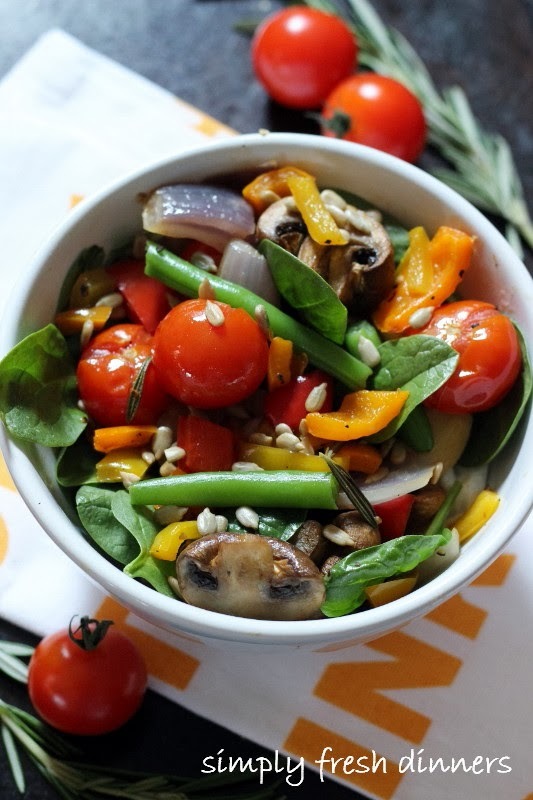 I have never had roasted vegetables on a salad, but I’m sure the flavors are fantastic. Do you cool all of the vegetables or is this a hot and cold salad? Just the spinach is cold and it quickly warms up when you mix it with the other ingredients. Thanks so much for you kind comments. Great link party you have! This salad looks divine. I can’t wait to try it out! Thanks so much, Heather, and thanks for visiting. This salad looks incredible!! Thanks so much for linking to Less Laundry, More Linking party!! Thank you, Nancy. Every time I join your link party, I chuckle at the name, lol. Oh wow, this looks incredibly good! I agree with Heather, I can’t wait to try it out 🙂 And might I just add that you share some of the most amazing recipes! Hugs and blessings! lol, Stephanie. You’re always so kind about my recipes. One day I’m going to cook kidneys or haggis just to see what you say! Thanks so much, sweet lady! This looks like one healthy salad!! Thanks for linking up to Wake Up Wednesdays! Recipe is pinned! Thanks, Meghan. Love your beautiful blog! Fabulous, this salad is just Fabulous! Thank you so much for sharing with Full Plate Thursday and hope you have a great weekend! Thanks so much, Miz Helen. Always enjoy participating in your party! Roasting veggies is the best way to enjoy them! This looks so fresh and delicious! Thanks so much for sharing this at Saturday Night Fever! Thanks, Heather. It’s my pleasure to join your party. Thanks, Danielle. I always like a little crunch in my dish so I’ve been known to toss in the craziest things, lol. Loved your party and loved reading about your open house! This is such a great harvest bowl of goodies! Yum! Thanks, Pamela. I really enjoyed your blog and look forward to visiting again. Very delicious and good for you! Looks amazing. What a nice surprise to wake up to, Ladies! Thank you so much. Thanks so much for the feature and the kind comments, Molly. It’s a real honour to be featured on your blog! Have a great Thanksgiving. I love this salad! It looks delicious. I pinned it! I will following all your social medias. Thanks so much, Diane. It was a pleasure to join your party today! I love how pretty this salad is and I bet it tastes great too!! Thank you so much for linking it up to Saturday Dishes! Pinning. Hope to see you again next week! My pleasure, Lucy, and thanks for the kind words and visit! Thanks, Rachel. It’s one of my favourite dishes. So glad you stopped by. WOW! That looks amazing! And perfect for Fall! Thanks for linking up to the #homematters linky party! We hope to see you again this coming Wednesday!